Suzi Nassif, has over the years chosen to paint portraits that speak in full expressions the concealed thoughts and her aspirations. 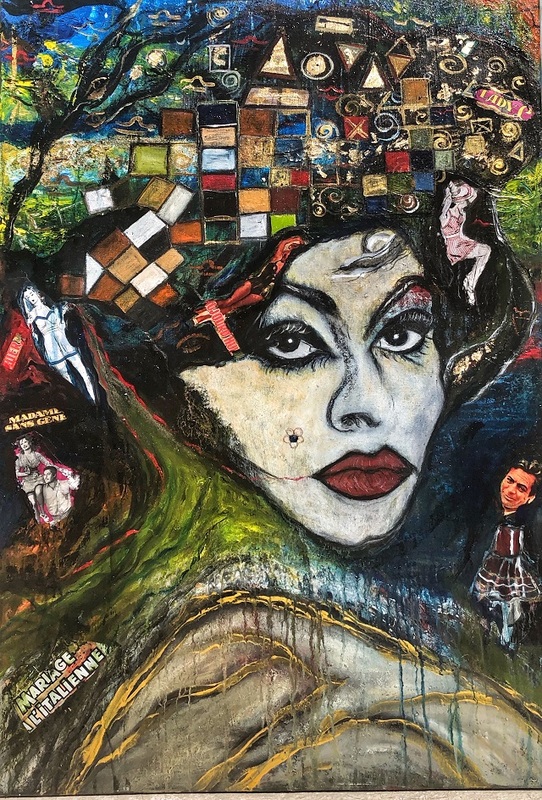 As one of the famous modern portrait artists of our time, Suzi Nassif has given birth to paintings that expressed the unseen thoughts or imaginations of her subject characters. In a nutshell, we will be looking at some selected women who have affected their generation living in an extraordinary way and style. These women span from all walks of life revealing their strengths in various ways. We are going to selectively look into these noble outstanding characters, by understanding the role each of them played in their fields, their general importance and try to see them through the artistic eyes of Suzi Nassif and how she portrayed them in her famous oil paintings. The first on our list is Eve, the very second in the human race, the mother of all and the wife to Adam. She was recorded in the Bible as the one through which the fall of man came and the first sin committed, making man to lose the original plan God had for humanity by allowing the serpent deceive her into eating the forbidden fruit. 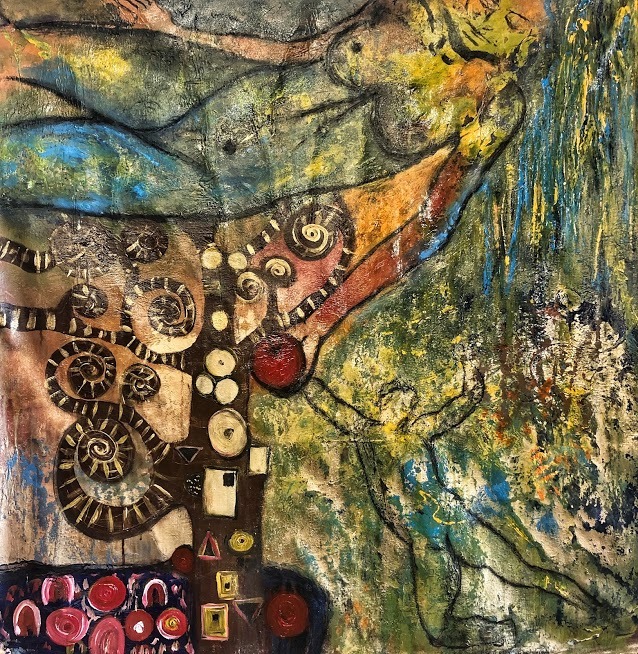 Suzi Nassif in two of her acrylic paintings on canvas (Adam and Apple, Adam and Eve) tries to portray this story revealing how the fall came from the woman who has the fruit in her hand to fall of man as he tries to reach out to her. Known in history as the Egyptian slave of Sarah, Abraham’s wife, she was given to Abraham as a wife by Sarah in order to produce children of which the product of that affair was Ishmael the first son of Abraham. In Islam, Hagar is till today honored as an important matron of monotheism who through her son Ishmael, Muhammad came to be as is found in the Quran. 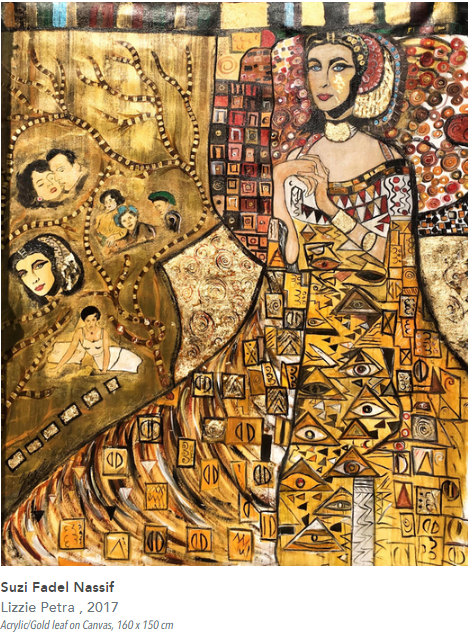 In 2016, Suzi Nassif painted “Hagar: The dream catcher” using acrylic, gold leaf on canvas painting. In this portrait, Suzi Nassif presents Hagar as a woman of willpower and individuality. It has also been said that this painting goes on to portray her strong stand for her belief and aspirations; revealing her intense support for the recognition of aspirations and ambitions of women. The history of the Egypt will never be complete without mentioning Cleopatra, being the last active ruler of Pyolemaic Kingdom, who grew to become so powerful in her days, which was not void of wars and bloodshed. She was a diplomat, linguistic, naval commander and was also a medical author. In a world where men dominated, Cleopatra grew to create a space for herself, finding a way around anything that would secure her stay in power. Through numerous works of art, her legacy has been preserved, both in ancient times and in the present and these famous oil paintings remain the subject of many works in Regeneration and Elaborate art. 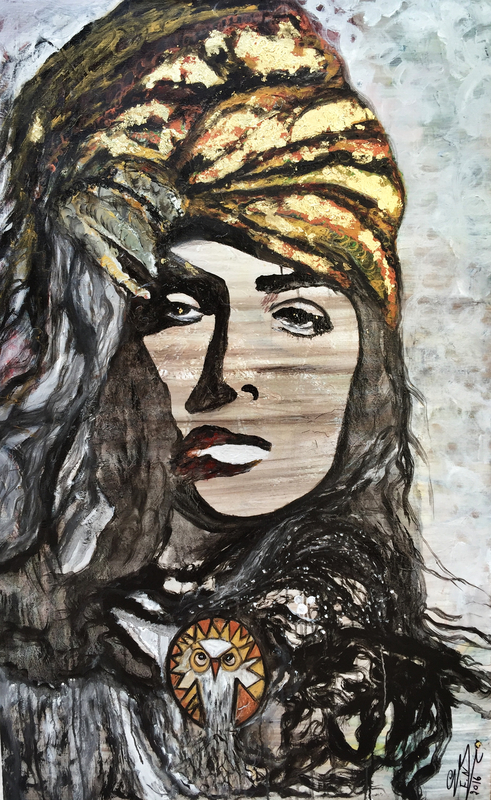 Suzi Nassif in Lizzie Petra ones again through her acrylic artistic paintings on canvas reveals the beauty of Cleopatra in all her glory, showing the strength of her might in a world of men, not keeping aside her romantic adventures with her contemporaries. A portrait that encourages in the face of troubles and sacrifice for a world she loves. The American born icon in the world of fashion. A lover of jewelry especially colorful ones with high interest in bold and bright fabrics. Iris Apfel’s reputation gave her the opportunity to have worked on the design for the restoration of the White House for nine executive presidents. She was known for her oversized glasses which even in these later days of her life is still a part of her style. As an icon in the fashion industry who lived to inspire many which can be seen on the acrylic paintings on canvas were Suzi Nassif portrays Irish‘s love for colorful jewelries, for color itself and creativity. 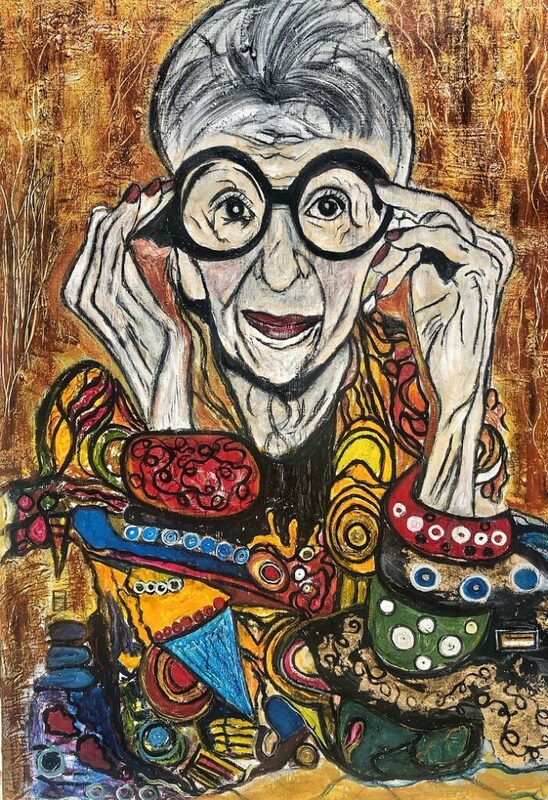 This acrylic painting on canvas portrait which Suzi calls “The color of Iris” did not leave out the oversized glasses of Iris but also goes further to depict her vivacious personality. An elegant actress, started pageantry at age a very early age of 16, Sophia Loren gradually over time became one of the icons in the world of acting. The Italian born actress’ glamor and beauty made her stand out from her contemporaries then. Sophia Loren’s early performance was an international film which brought her out to the world through her five-picture contract with Paramount Pictures in 1958. Among her films at this time were Desire Under the Elms with Anthony Perkins. Here is Marlene Dietrich born in Berlin, an outstanding actress, whose stories inspires all who came close enough that one can stand tall against all odds, moving to a height of unimaginable success. The fact that she came from the notorious demimonde of her country didn’t deter her from waxing stronger both in beauty and style. She showed a high level of strength during the world War as she deemed it possible in a male dominated arena to reach down to others and show love. A lot can be said about her which can be found in the paintings of Suzi Nassif presenting on an acrylic canvas which describes Marlene Dietrich as Madame Marlene and goes on to tell tales of evolves from a deeper sense of reality, beyond visibly known images.